There are two piano parts for this piece, for either the A or Bb clarinet version (see options below). For some years I had been toying with the idea of writing a piece in memory of my late father, the clarinettist Edward “Ted” Planas. In April 1969 Alan Hacker had performed Mozart’s “restored” Clarinet Concerto K.622 on the first modern basset-clarinet which he had commissioned from Ted, who was well known for his craftsmanship in designing, restoring and repairing woodwind instruments for his fellow players. 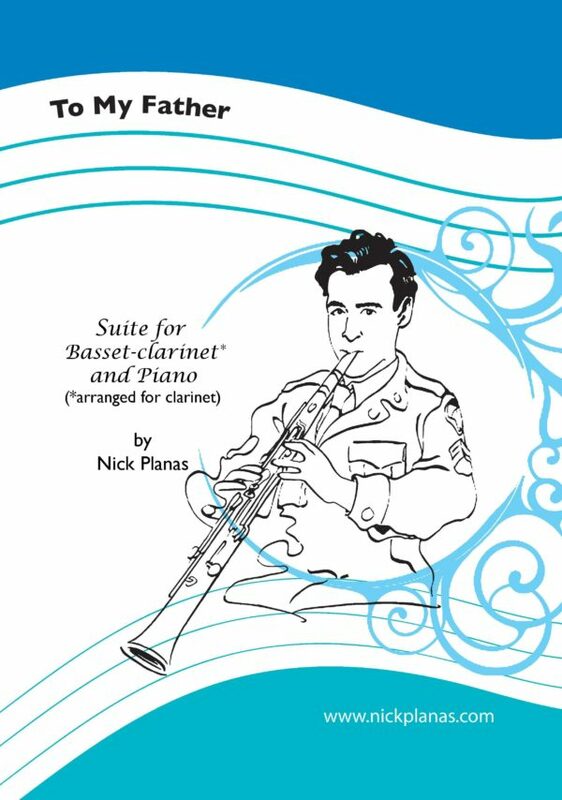 The basset-clarinet is an extension of the ordinary clarinet by four additional semitones, in such as way as to be playable chromatically. My intention was to compose a work for the basset-clarinet that Ted would have enjoyed both hearing and playing, in styles which he would have been familiar with, and for an instrument which he helped to pioneer in the modern era. The work has five movements – the audio clips of the first three movements are performed by Margaret Archibald (basset-clarinet) and John Flinders (piano), and the final two movements by Lucy Downer (basset-clarinet) and Cliodna Shanahan (piano). The first three movements were first performed on 3rd February 2014 at St.Sepulchre without Newgate (The Musician’s Church), Holborn, London, by Margaret Archibald (Basset-clarinet) and John Flinders (Piano). Margaret played on the prototype “Selmer of Paris” basset-clarinet which had been gifted by them to Ted Planas in the early 1970s, and modified by Daniel Bangham in 2014.